Today I have not one, but two goodies for you all. One, I’ve posted the first ten percent of Rhapsodic for those of you eager to get a glimpse into my newest series. 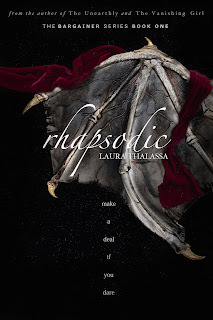 And two, the pre-order for Rhapsodic is also up! Rhapsodic will officially be available for purchase on November 15, so there’s just a little under a month until its release! I am so, so, so excited to finally share the first ten percent of Rhapsodic with you! This book has fairies and curses, romance and a decade’s old mystery. I especially love Callie Des—a.k.a., the Bargainer—and I can’t wait to share them with you all. The book has changed a lot from its first inception, which began two and a half years ago, and I love the story it’s become. I hope you will as well! The sample you’re about to read is still being edited, so there may very well be errors or last minute changes to details. I hope you’ll forgive me for those—I wanted to reward you all a little early for being so patient! A word on the site I’m using to share the sample sample. I’m using Instafreebie, which is a site a lot of authors and publishers use to share books, and Instafreebie makes it easy for the reader to read the text on their e-reader, whether that be a Kindle, a Nook, another e-reader, or your phone. You will be automatically subscribing to my newsletter by downloading the sample (unless, of course, you’re already on my newsletter! ), which I thought was fair, since in the past I’ve only released previews to my newsletter. I only ever send out emails on new and upcoming releases, and you can unsubscribe from my mailing list at any time. I hope you stick around! You can read the first ten percent of Rhapsodic here!